Located in Michoacán State, Volcan Paracutín takes its place among many other volcanos that fill the landscape here. They seem to be everywhere you look; ancient verdant cones scoured all down the sides by years of water erosion. They look quite uniform, actually. What makes Paricutín unique is that it is just a wee young baby born on February 20, 1943, to be precise. Fancy a more in depth view of what Mexico has to offer? Click on the book below to find out how to get your own comprehensive Mexico guide. Lonely Planet has been one of the top go-to guides for travellers for more than 40 years! Now covering what used to be a cornfield, Paricutín would continue to belch steam, sparks and ash for nearly 10 years. During its formation it very slowly consumed the villages of San Salvador Paricutín and San Juan Parangaricutiro, leaving only the church of the latter village poking up out of the solid ground. It is quite eerie hiking into the site from the village of Angahuan, for at some point you reach the end – or beginning – of the lava flow. Molten rock just seems to have suddenly given up moving, causing it to look quite stark compared to the rest of the area. The solid ground cover spawned from the eruption, as well as the volcanic peak itself, is so young that it is nearly void of any vegetation at all. The black cone looks like a giant pile of coal in a sea of green spires and rolling farmland. The church, built in 1618, seems to be growing from the earth; your very own sci-fi movie set. The level of lava flow made it up to what would have been the roof of the church, which is gone. The inside of the building and the altar were mostly spared. Liquid rock was stopped by the stone walls; only a bit seeped in here and there via windows and doors. It is possible to stand atop what would have been the ledge of the church and peer inside. Quite a site, indeed! The church would have almost certainly been right in front of the village square, along with some houses and shops. It’s all gone now. Destruction caused by a volcano, which is actually considered a constructive force of nature! Muse on that sweet bit of irony!! Up in the hills of the Huasteca region, shrouded all in clouds, lay the town of Xilitla. Say he-leet-la. There you go. All around the area are lush enclaves of jungle cut through with rivers so pure they are blue. The town, while pleasant enough, is best known for its surreal concrete installations set up in the wilds just a short stroll from he-leet-la. Say it like a pro! 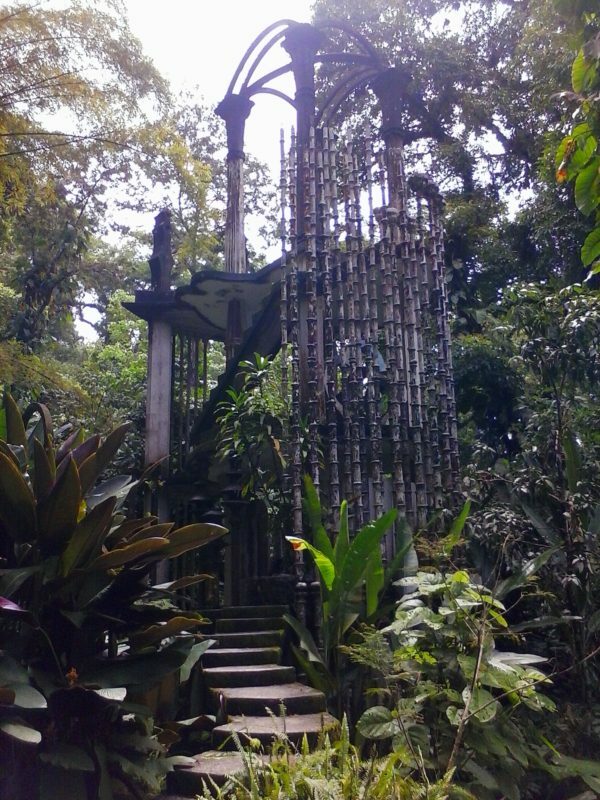 The park at Las Pozas was brought to life by the imagination – and money – of Edward James. Born in England into a very wealthy family, Mr. James did not quite fancy himself an aristocrat. Instead he was more concerned with artistic and existentialist pursuits. His wealth allowed him to amass, at the time, the largest private artwork collection in the world. His travels brought him to Xilitla, where he designed and had built what can only be described as the most bizarre-looking collection of concrete pagodas, columns, sidewalks, bridges and pavilions at all sorts of angles that totally defy logic. The stairs and walkways defy safety, as well! Imagination, whimsy, boldness, garishness and a bit of humor went into the designs here. James picked a lovely spot, right next to a gushing waterfall that forms Las Pozas (The Pools). There’s that clear blue water! Navigating around this park is not for the faint hearted, for there is nothing to prevent one from climbing up, on, or into anything. You are just as free to fall off anything, as well. The stairways twist madly, disappear suddenly, and drop off without warning, all by design. There were never meant to be guard rails and they do not exist to this day. The jungle is always quick to overgrow and consume anything in its path, and here we have that at work. Somehow it adds to the overall flair of the place. What a mad riot of eccentric display! It would have to be the remoteness and how easy it is to get yourself lost – in a figurative sense – that earns Real de Catorce a spot in this post. Just getting here poses a bit of a challenge if you do not have your own wheels under you. The public bus service is spotty and always in flux. If you are lucky enough to get a bus to “Real”, that only solves a portion of the problem. The next hurdle involves the fact that your coveted bus is too big to make it through the 2 mile “tunnel” that leads into the town itself. You “de-bus” and place yourself on a much smaller vessel that can negotiate the little hole bored through the hillside. Keep calling it a tunnel if that makes you feel any better. Making things even more time consuming is the fact that the tunnel is only wide enough for one direction of traffic at a time. Workers, in contact via telephone at either end, keep the flow moving smoothly. Yes, one does not happen upon a place like this.Your Drifters spent a full day and 3 hitched lifts just to get here! This remote town is today home to about 1200 souls. However, evidence of its heyday as a silver mining city of 40,000 lay all around the hills, and even within the present-day town itself. Life was good here back in the day. The most dramatic proof this dame ain’t what she used to be are the now defunct stone structures that slumber in the hills surrounding Real de Catorce. One is free to explore these ruins and wonder what they were once used for. When you are done exploring the old buildings you can hike up over the hills and find yourself alone. Really alone. No signs of civilization, past or present. We visited Real de Catorce twice on this year-long trip. Our days were spent picking random hills to hike over and deciding which goat paths to follow. Just pick any direction to set out in and prepare to be blown away by how empty this land is. These arid mountains are covered in cactus and scrub bush, letting you see for miles around you. You are in the middle of a whole lot of nothing, and that puts you in the middle of the moment. Your sense of awareness becomes focused. Intense stuff, baby! What a rare feeling that can be these days. Life is full of distractions that are either forced upon us or chosen by us and we lose track of the world at our very own feet; even the prospect of just being alone in our own thoughts causes one to grab something in order to snap out of that moment of idle. The all day hikes we went on here were not only other-worldly, as the title of this post suggests; they were own-wordly as well. Get out there and get lost for a bit!! !